who passed way this yr 2005..
'A Family Souvenir" it has some of older stuff on it and some new songs as well . we are proud of this cd , My dad ( Vernon ) has 1 song on this new cd that he wrote back in 1986 and we are real proud of that and scott has also put a couple on that people havent heard in a while like 'souvenirs " that is a John Prine song , also on track 13 is a special song that 3 yr old skyanna Sutton sings with her grandpal that just real shocked all of us when she wanted to do it .. 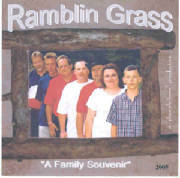 So we think that this cd has somthing for everyone on it , some slow and some hard driven bluegrass on it ..
so i guess the name of this cd hits the nail on the head, becuse to us it is a" Family Souvenir"
we would like to send a special thanks to "OLe Barn Productions " in Jackson K.Y. The song 'SniffDipper " is a doing real good , it is getting a lot of air time on wsgs in hazzard K.y. and also wmmt in whitesburg K.y. . it was a song written by Mike Snider , and scott dedcied to put it on our new cd and people seem to like the song very well , it is our most requsted that people want to hear. we would like to thank everyone who came out to our 2and Annual Bluegrass festvial at 'pine patch park" in Leslie Co. we had a big turn out and some of the greatest local talent around . we hope to see everyone next yr. and we hope it keeps getting bigger !
" We dont claim to be anything big just a bunch of folks who love to sing and play bluegrass music"